1. Preheat the barbecue until the coals turn grey. Add the spinach to a pan with just enough water to cling to the leaves. Cook until wilted then drain and leave to cool. 2. Meanwhile, place the breadcrumbs, chilli flakes, parsley and cheese in a large bowl. Remove the meat from the sausages and add it to the bowl. Squeeze the excess water from the spinach, chop and add to the bowl. Season, then mix everything together. 3. To fill the peppers: from the stalk end, cut along the pepper to make a pocket. Remove the seeds. 4. Spoon the sausage filling into the peppers and press it along the length of the pepper with your fingers until it is filled. Tie the peppers at intervals with string to secure. 5. Brush the peppers with olive oil and barbecue for 3-4 minutes until slightly charred, turn and cook for another 3-4 minutes. Move to a cool part of the barbecue, cover and cook for 20 minutes until the peppers are tender and the filling is cooked through with no pink meat. 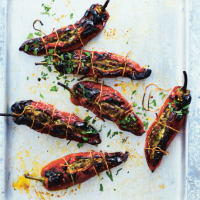 If it’s not barbecue weather, heat a griddle pan and cook the filled peppers for 3-4 minutes, then turn and cook for a further 3-4 minutes until lightly charred. Transfer to a baking tray and place in an oven preheated to 200°C, gas mark 6 and cook for 20 minutes until the filling is cooked through.